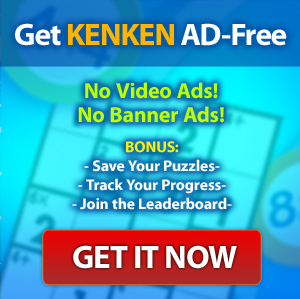 KenKen Math Puzzles Legal Notice - Free Online Brain Puzzles. These Terms of Service, as amended from time to time, govern your use of all websites and other products or services to which you have access, any product or service that requires an Internet connection or Account (as defined below) to access, install or play, as well as any Account used to access any of our products or services (the “KenKen Services”) offered by KenKen Puzzle, LLC or any of its subsidiaries and affiliates (collectively, “KenKen”). An “Account” may be required to access and use some of the KenKen Services. To create an Account, you must have an email address, and provide truthful and accurate information. You must be eligible to use the KenKen Service for which you are registering. In addition, some KenKen Services may require creation of a "user name" that is tied to your Account. You may not use a user name that is used by someone else, is objectionable to KenKen, or otherwise violates these Terms of Service. You are solely responsible for all activity on your Account. Your Account may be terminated if someone else uses it to engage in activity that violates these Terms of Service or is otherwise improper or illegal. You should not reveal your Account password to others. KenKen will not ask you to reveal your password, or initiate contact with you asking for answers to your password security questions. The communications between you and KenKen are electronic. You consent to receive communications from KenKen in an electronic form. You agree that all terms and conditions, agreements, notices, disclosures and other communications that we provide to you electronically satisfy any legal requirement that such communications would satisfy if they were in writing. "Content" on KenKen Services includes software, technology, text, forum posts, chat posts, profiles, widgets, messages, links, emails, music, sound, graphics, pictures, video, code, and all audio-visual or other material appearing on or emanating to or from KenKen Services, as well as the design and appearance of our websites and all licensed rights granted, provided or purchased by you to access or use (online or off-line) elements or features of KenKen Services including but not limited to paid and free downloadable content. Content also includes user-generated Content ("UGC") which includes, but is not limited to, user names, forum posts, chat posts, profile content and any other Content contributed by users to KenKen Services. KenKen does not pre-screen UGC and does not endorse or approve any UGC that you and other users may contribute to KenKen Services. You bear the entire risk of the completeness, accuracy or usefulness of Content found on KenKen Services. All Content is owned by KenKen or its affiliates, subsidiaries, licensors or suppliers with the exception of UGC. If you contribute UGC to any KenKen Service, you expressly grant to KenKen a non-exclusive, perpetual, worldwide, sub-licensable and irrevocable right to quote, re-post, publish, use, adapt, translate, archive, store, reproduce, modify, create derivative works from, syndicate, license, print, sublicense, distribute, transmit, broadcast, and otherwise communicate, and publicly display and perform the UGC, or any portion thereof, in any manner or form and in any medium or forum, whether now known or hereafter devised, without notice, payment or attribution of any kind to you or any third party. You grant KenKen all licenses, consents and clearances to enable KenKen to use such UGC for such purposes. You waive and agree not to assert any moral or similar rights you may have in such UGC. KenKen reserves the right (but has no obligation except as required by law) to remove, block, edit, move or disable UGC for any reason, including when KenKen determines that UGC violates these Terms of Service. The decision to remove UGC or other Content at any time is in KenKen’s sole and final discretion. To the maximum extent permitted by applicable law, KenKen does not assume any responsibility or liability for UGC or for removal of UGC or any failure to or delay in removing UGC or other Content. You are solely responsible for your UGC and may be held liable for UGC that you post or supply. KenKen grants you a personal, limited, non-exclusive license to use Content to which you have access for your personal, private, non-commercial, non-transferable, limited use solely as set forth herein and as set forth in any additional documentation and agreements applicable to the KenKen Services accessed by you. Content and all other intellectual property rights in or on KenKen Services as well as the products and services offered through KenKen Services, are owned by KenKen or KenKen's third party licensors and is protected by United States and International copyright, trade dress, and trademark laws, international conventions, and other laws protecting intellectual property and related proprietary rights. You may not copy or download any Content from any KenKen Service unless you are expressly authorized to do so. In addition, unless expressly authorized by KenKen, you may not distribute, publicly perform or display, lease, sell, transmit, transfer, publish, edit, copy, create derivative works from, rent, sub-license, distribute, decompile, disassemble, reverse engineer or otherwise make unauthorized use of Content. Any commercial use is prohibited. You agree not to remove, obscure, or alter copyright, patent, trademark, or other proprietary rights notices affixed to Content. KenKen reserves all right, title and interest in Content and all associated copyrights, trademarks, and other intellectual property rights therein that are not expressly granted to you in these Terms of Service. Your permitted use of Content described above is limited by the intellectual property rights of KenKen and does not include any rights to other patents or intellectual property. Making unauthorized copies or distribution of Content found on KenKen Services may result in the termination of your Account, prohibition on use of KenKen Services, and further legal action. You agree to indemnify and hold harmless KenKen from any unauthorized or illegal conduct by you, or through the use of your Account, on KenKen Services. Content may only be held in Accounts belonging to legal residents of countries where access to and use of Content is permitted. KenKen reserves the right to refuse your request to acquire Content, and KenKen reserves the right to limit or block any request to acquire Content for any reason. We do not guarantee that any Content will be available at all times, in all countries or geographic locations, or at any given time or that we will continue to offer particular Content for any particular length of time. We reserve the right to change and update Content without notice to you. You must have the legal right to use any Content you upload, post or otherwise supply in connection with the KenKen Services. You may not upload or post any Content on KenKen Services that infringes the copyright, trademark or other intellectual property rights of a third party nor may you upload Content that violates the law, these Terms of Service or any third party's right of privacy or right of publicity. KenKen may, without prior notice to you and in its sole judgment, remove Content that may infringe the intellectual property or other rights of a third party. If you are a repeat infringer of KenKen's or a third party's intellectual property or other rights, KenKen may terminate your Account without notice to you. If your Account is terminated, you are not entitled to a refund for any fees you have paid, and you will lose access to Content associated with your Account. Some KenKen Services require payment of a fee. You must have an Account and pay the subscription or other fees to participate in these activities. FEES ARE PAYABLE IN ADVANCE AND ARE NOT REFUNDABLE IN WHOLE OR IN PART UNDER ANY CIRCUMSTANCES. KenKen reserves the right to change fees or billing methods at any time. If you pay a periodic (such as monthly, annually or semi-annually) subscription for a KenKen Service, KenKen will provide you with notice of any changes to the fees or billing methods at least thirty (30) days in advance by posting such changes on the KenKen Service or contacting you at the e-mail address associated with your Account. You are responsible for reviewing the KenKen Service to obtain timely notice of such changes. Your continued use of the KenKen Service thirty (30) days or more after posting or notice to you of the changes means that you accept such changes. If any change is unacceptable to you, you may cancel your subscription at any time, but KenKen will not refund any fees that may have accrued to your Account before cancellation of your subscription, and we will not prorate fees for any subscription. If your use of KenKen Services is subject to use or sales tax, then KenKen may also charge you for any such taxes, in addition to the subscription or other fees. You may pay fees using the methods available for the particular KenKen Service and you agree to the terms and conditions applicable to each payment method you choose. Payment methods may vary by KenKen Service. When you provide credit card or other payment information to KenKen, you represent to KenKen that you are the authorized user of the credit card or other payment method. By agreeing to these Terms of Service, you have agreed to permit KenKen to automatically renew your subscription to each KenKen Service to which you subscribe by charging a valid credit card number which you have provided to KenKen. Your subscription will be automatically renewed thirty (30) days prior to the expiration of the term and each anniversary thereafter for a fee no greater than KenKen's then-current price, excluding any promotional and discount pricing, unless you cancel your subscription. You must provide current, complete, and accurate information for your billing account. You must promptly update all information to keep your billing account current, complete, and accurate (such as a change in billing address, credit card number, or credit card expiration date), and you must promptly notify KenKen if your credit card is canceled (for example, for loss or theft). If you fail to provide KenKen any of the foregoing information, you agree that KenKen may continue charging you for any subscription automatically renewed unless you cancel your subscription at least thirty (30) days prior to the expiration of the subscription. KenKen reserves the right to utilize third party credit card updating services to obtain current expiration dates on credit cards provided by you to KenKen. Customers who use a payment method other than credit card, if permitted, may incur an additional payment processing fee, and may not be able to automatically renew subscriptions. As the Account holder, you are responsible for all charges incurred, including applicable taxes, and all purchases made by you or anyone that uses your Account, including your family or friends. For some KenKen Services, KenKen may offer a free trial subscription. If you accept a free trial subscription, KenKen will begin to bill your Account for that KenKen Service when the free trial subscription expires, unless you cancel your subscription before that time. You are always responsible for any internet service provider, telephone, wireless and other connection fees that you may incur when using KenKen Services, even when we offer a free trial subscription. We may provide links to other web sites. Some of these web sites may charge separate fees, which are not included in any subscription or other fees that you may pay to KenKen. Any separate charges or obligations that you incur in your dealings with third parties are your responsibility. KenKen may terminate access to any KenKen Services (or any portion thereof) at any time by giving you notice of such termination within the time period specified when you joined the particular KenKen Service, or if no time period for notice of termination was specified, then within thirty (30) days of the date such notice is either (at KenKen’s discretion) provided to you via email or is posted on the applicable KenKen Service. KenKen may also terminate access to KenKen Services for violation of these Terms of Service, if KenKen (in its sole discretion) deems that your use of KenKen Services renders KenKen Services less safe for others or for illegal or improper use of KenKen Services, Content, or intellectual property as determined by KenKen in its sole discretion. You may lose your user name as a result of termination. If you have more than a single Account, KenKen may terminate all of your Accounts and all related Content. In response to a violation of these Terms of Service or any other agreement applicable to KenKen Services accessed by you, KenKen may issue you a warning, suspend your Account, selectively remove Content at an Account or device level, immediately terminate any and all Accounts that you have established or temporarily or permanently ban your device or machine from accessing all KenKen Services or certain KenKen Services. You acknowledge that in such an instance KenKen is not required to provide you notice before taking action to suspend or terminate your Account, temporarily or permanently banning your device from some or all KenKen Services or selectively removing Content associated with your Account. If KenKen terminates your Account, you may not participate in any KenKen Service again without KenKen's express permission. KenKen reserves the right to refuse to keep Accounts for, and provide KenKen Services to, any individual. You may not allow individuals whose Accounts have been terminated by KenKen to use your Account. If your Account, or a particular subscription for a KenKen Service associated with your Account, is terminated, suspended or if any Content is selectively removed from your Account or if your device is temporarily or permanently banned from accessing some or all KenKen Services, no refund will be granted or credited to you or converted to cash or other forms of reimbursement, and you will have no further access to your Account or Content associated with your Account or the particular KenKen Service. You have the right to cancel your Account or a particular subscription to a KenKen Service at any time. If you do not agree to the terms in these Terms of Service, your sole remedy is to not use KenKen Services and to cancel your Account or applicable subscriptions. You understand and agree that the cancellation of your Account or a particular subscription is your sole right and remedy with respect to any dispute with KenKen, including any dispute related to, or arising out of any term of these Terms of Service or KenKen's enforcement or application of these Terms of Service; the Content available through KenKen Services or any change in Content provided through KenKen Services; your ability to access or use KenKen Services or any Content thereon; or the amount or type of fees, surcharges, applicable taxes, billing methods, or any change to the fees, applicable taxes, surcharges or billing methods for KenKen Services or any Content thereon. KenKen reserves the right to collect fees, surcharges or costs incurred before you cancel your Account or a subscription to a KenKen Service. You are also responsible for any amounts owed to third-party vendors or content providers before your cancellation. Any delinquent or unpaid fees and other unresolved issues with KenKen Services must be settled before you establish a new Account. You may violate these Terms of Service if, as determined by KenKen in its sole discretion, you engage in any behavior that is illegal, abusive, or otherwise disruptive of the KenKen Services or our ability to provide the KenKen Services to other users; if you promote, encourage or take part in any activity involving hacking, cracking, or phishing; upload files that contain a virus, worm, spyware, time bombs, corrupted data or other computer programs that may damage, interfere with or disrupt KenKen Services; or if you interfere with the ability of others to enjoy using a KenKen Service or take actions that interfere with or materially increase the cost to provide a KenKen Service for the enjoyment of all its users. You must also obey all federal, state, and local laws, regulations and rules that apply to your activities when you use KenKen Services. KenKen reserves the right to terminate your Account and to prevent your use of any and all KenKen Services if your Account is used to engage in illegal activity or to violate these Terms of Service. Unless otherwise specified, there is no requirement or expectation that KenKen will monitor or record any online activity on KenKen Services, including communications. However, KenKen reserves the right to access and record any online activity on KenKen Services and you give KenKen your express consent to access and record your activities. KenKen reserves the right to remove any Content from any KenKen Service at KenKen's sole discretion. KenKen has no liability for your or any third party's violation of this Agreement. KenKen Services may require or allow you to download software, software updates or patches, or other utilities and tools from KenKen or its licensors onto your computer or device (“KenKen Software”). KenKen grants to you a non-exclusive, limited license to use KenKen Software solely for the purpose stated by KenKen at the time the KenKen Software is made available to you. If an end user license agreement is provided with the KenKen Software, your use of the KenKen Software is subject to the terms of that license agreement as well. You may not sub-license, or charge others to use or access KenKen Software. You may not translate, reverse-engineer, reverse-compile or decompile, disassemble or make derivative works from KenKen Software. You may not modify KenKen Software or use it in any way not expressly authorized in writing by KenKen. KenKen Software may be subject to United States export controls, and export controls of other jurisdictions. By downloading KenKen Software from KenKen, you warrant that you are not located in any country, or exporting KenKen Software to any person or place, to which the United States or any other jurisdiction has embargoed goods. You agree to abide by U.S. and other applicable export control laws and not to transfer, by electronic transmission or otherwise, any Content or KenKen Software subject to restrictions under such laws to a national destination prohibited by such laws, without first obtaining, and then complying with, any requisite government authorization. You further agree not to upload to KenKen Services any data or software that cannot be exported without prior written government authorization, including, but not limited to, certain types of encryption software. The assurances and commitments in this Section shall survive termination of this Agreement. TO THE MAXIMUM EXTENT PERMITTED BY APPLICABLE LAW, YOU EXPRESSLY AGREE THAT THE USE OF KENKEN SERVICES, KENKEN SOFTWARE, AND THE INTERNET IS AT YOUR SOLE RISK. KENKEN SERVICES, KENKEN SOFTWARE, KENKEN PRODUCTS AND THIRD-PARTY SERVICES AND PRODUCTS ARE PROVIDED ON AN "AS IS" AND "AS AVAILABLE" BASIS FOR YOUR USE, WITHOUT WARRANTIES OF ANY KIND, EITHER EXPRESS OR IMPLIED, UNLESS SUCH WARRANTIES ARE LEGALLY INCAPABLE OF EXCLUSION. NO WARRANTY IS GIVEN ABOUT THE QUALITY, FUNCTIONALITY, AVAILABILITY OR PERFORMANCE OF KENKEN SOFTWARE OR KENKEN SERVICES. KENKEN DOES NOT ASSUME LIABILITY FOR INABILITY TO OBTAIN OR USE ANY CONTENT, GOODS OR SERVICES. KENKEN PROVIDES KENKEN SERVICES ON A COMMERCIALLY REASONABLE BASIS AND DOES NOT GUARANTEE THAT YOU WILL BE ABLE TO ACCESS OR USE KENKEN SERVICES AT TIMES OR LOCATIONS OF YOUR CHOOSING, OR THAT KENKEN WILL HAVE ADEQUATE CAPACITY FOR KENKEN SERVICES AS A WHOLE OR IN ANY SPECIFIC GEOGRAPHIC AREA. TO THE MAXIMUM EXTENT PERMITTED BY APPLICABLE LAW, YOU ACKNOWLEDGE AND AGREE THAT YOUR SOLE AND EXCLUSIVE REMEDY FOR ANY DISPUTE WITH KENKEN OR ITS LICENSORS ARISING OUT OF OR RELATING TO KENKEN SERVICES OR KENKEN PRODUCTS IS TO STOP USING KENKEN SERVICES, AND TO CANCEL YOUR ACCOUNT. YOU ACKNOWLEDGE AND AGREE THAT KENKEN, ITS LICENSORS, LICENSEES AND AFFILIATES ARE NOT LIABLE FOR ANY ACT OR FAILURE TO ACT BY THEM OR ANY OTHER PERSON REGARDING CONDUCT, COMMUNICATION OR CONTENT ON KENKEN SERVICES OR USE OF KENKEN SOFTWARE. IN NO CASE SHALL KENKEN OR ITS LICENSORS', LICENSEES', AFFILIATES', EMPLOYEES', OFFICERS', OR DIRECTORS' (COLLECTIVELY, "KENKEN AFFILIATES") LIABILITY TO YOU EXCEED THE AMOUNT THAT YOU PAID TO KENKEN FOR KENKEN SERVICES. IN NO CASE SHALL KENLEN OR KENKEN AFFILIATES BE LIABLE FOR INCIDENTAL OR CONSEQUENTIAL DAMAGES ARISING FROM YOUR USE OF KENKEN SERVICES, KENKEN SOFTWARE, THE INTERNET OR FOR ANY OTHER CLAIM RELATED IN ANY WAY TO YOUR USE OF KENKEN SERVICES OR ACCOUNTS. WHILE KENKEN USES COMMERCIALLY REASONABLE MEANS TO PROTECT YOUR PERSONAL INFORMATION, KENKEN ASSUMES NO LIABILITY FOR LOSS OF DATA, DAMAGE CAUSED TO YOUR SOFTWARE OR HARDWARE, AND ANY OTHER LOSS OR DAMAGE SUFFERED BY YOU OR ANY THIRD PARTY, WHETHER DIRECT, INDIRECT, INCIDENTAL, SPECIAL, OR CONSEQUENTIAL AND HOWEVER ARISING, AS A RESULT OF ACCESSING OR USING ANY KENKEN SERVICE, CONTENT, KENKEN SOFTWARE TO YOUR COMPUTER OR DEVICE. BECAUSE SOME STATES OR JURISDICTIONS DO NOT ALLOW THE EXCLUSION OR THE LIMITATION OF LIABILITY FOR CONSEQUENTIAL OR INCIDENTAL DAMAGES, IN SUCH STATES OR JURISDICTIONS, KENKEN'S AND KENKEN AFFILIATES' LIABILITY SHALL BE LIMITED TO THE FULL EXTENT PERMITTED BY LAW. KENKEN DOES NOT ENDORSE, WARRANT OR GUARANTEE ANY THIRD PARTY PRODUCT OR SERVICE OFFERED THROUGH KENKEN AND WILL NOT BE A PARTY TO OR IN ANY WAY BE RESPONSIBLE FOR MONITORING ANY TRANSACTION BETWEEN YOU AND THIRD-PARTY PROVIDERS OF PRODUCTS OR SERVICES. Upon KenKen's request, you agree to defend, indemnify and hold harmless KenKen and KenKen Affiliates, contractors, vendors, and content providers from all liabilities, claims and expenses, including attorneys' fees, that arise from or relate to a breach of these Terms of Service for which you are responsible or in connection with your distribution of any Content on or through KenKen Services. Without limiting the generality of the foregoing, you agree to indemnify and hold KenKen harmless from any improper or illegal use of your Account, including the illegal or improper use of your Account by someone to whom you have given permission to use your Account. You agree that you will be personally responsible for your use of KenKen Services and for all of your communication and activity on KenKen Services, including any Content you contribute, and that you will indemnify and hold harmless KenKen and KenKen Affiliates from any liability or damages arising from your conduct on KenKen Services, including any Content that you contribute. KenKen reserves the right, at its own expense, to assume the exclusive defense and control of any matter otherwise subject to indemnification by you. In that event, you shall have no further obligation to provide indemnification to KenKen in that matter. This Section shall survive termination of these Terms of Service. KenKen Services may include hyperlinks to web sites operated by third parties including advertisers and other content providers. Those sites may collect data or solicit personal information from you. KenKen does not control such web sites, and is not responsible for their content, privacy policies, or for the collection, use or disclosure of any information those sites may collect. You agree that these Terms of Service is not intended to confer and does not confer any rights or remedies upon any person other than the parties to these Terms of Service. If any part of these Terms of Service is held invalid or unenforceable, that portion shall be interpreted in a manner consistent with applicable law to reflect, as nearly as possible, the original intentions of KenKen, and the remaining portions shall remain in full force and effect. The failure of KenKen to exercise or enforce any right or provision of these Terms of Service will not constitute waiver of such right or provision. Any waiver of any provision of these Terms of Service will be effective only if in a writing signed by KenKen. The laws of the State of New York, excluding its conflicts-of-law rules, govern these Terms of Service and your Account. You expressly agree that exclusive jurisdiction for any claim or dispute with KenKen arising out of or relating in any way to your Account or your use of KenKen Services shall be resolved exclusively in the federal and state courts within the State of New York, and you further agree and expressly consent to the exercise of personal jurisdiction in such courts in connection with any such dispute including any claim involving KenKen or KenKen Affiliates, subsidiaries, contractors, vendors and content providers. In addition, the prevailing party in any suit or action arising out of these Terms of Service or your use of any KenKen Services shall be entitled to recover, in addition to any damages awarded, all reasonable attorneys’ fees and costs associated with the suit or action.